A special section JUST FOR KIDS that teaches them the characteristics of a “Nice Kid” and how to write a letter to Santa Claus himself! A section for ADULTS ONLY that explains what ReindeerCam is and provides more information about the nice list and show times. We have proof SANTA exists! Discover what over 5 million people already have–that Santa is real! Watch Santa’s reindeer live and see with your own eyes as Santa himself visits with them! 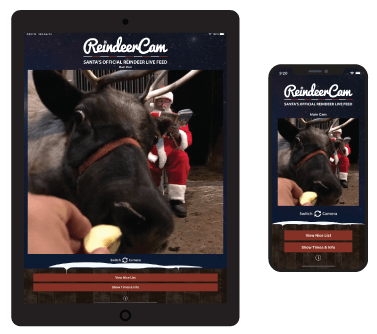 Watch Santa’s reindeer live 24/7! Watch on the go. Perfect for bedtime stories with Santa! See if you’re on the Nice List! Receive updates from the elves about special show times, RDC News and more!